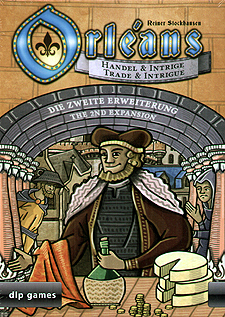 The second Orleans expansion stimulates trade by introducing Order, that allow you to grow your fortune, thereby presenting a new strategy in which you try to deliver gods to certain towns faster than the other players. The new Beneficial Deeds board provides a lot of options. You can now get essential goods, places, Technology tiles, and even actions if you provide the appropriate followers. Similar to the beneficial deeds board, the new Intrigue board allows you to send your followers there to hire various nefarious characters that will thwart your opponents' plans. Trade, progress, as well as everyday life in Orleans are influenced by new events. The uncertainly if and when the events occur gives the game a new kick. Important: You need a copy of the Orleans base game to play this expansion.